You miss your turn off. But instead of calmly waiting for the next driveway to turn around, you slam on your brakes, your car tail spinning a bit as it struggles to decrease it’s speed, and your world is suddenly shaken from it’s safe little cocoon as you make the hair pin turn to try and keep on your course. You accidentally drive into someone’s yard, scarring a pretty lawn with your ugly tire marks. A dog barks and scrambles to get out of your way as you struggle to regain control of your car that now seems to have a mind of it’s own. Your heart skips a beat and your adrenaline spikes at the unexpected change of course. That’s pretty much how I’m feeling right now after Kevin’s accident. Life threw us a curve ball and WOW. Can someone tell me what the hell just happened?!? This whole … experience, (nightmare?) totally and completely threw me for a loop. That fly ball not only came out of left field, it conked me in the temple and I’ve been living life through a hazy fog ever since. I’m just sort of existing right now. I’m waiting for my equilibrium to right itself because my world has just been knocked off kilter. Actually, I’m on auto-pilot. I get up. Run through a quick email check. Take a quick shower. Run the kids to school. Go to the hospital. Give Kevin a sponge bath. Change his clothes. Help transfer him to his wheelchair. Set up the laptop so he can work. Sit around while he works. (WHY does a body get SO TIRED just sitting around?) Wheel him around the hospital – mainly just to get him out of his room (if it’s a nice day, we go outside. If not, we sit by the window and watch traffic go by). Help him transfer back to his bed. Make sure he’s peed and is comfortable enough for his afternoon nap. Go back home. Go through mail and email, throw a load of laundry in the wash. Clean up the kitchen. Maybe take a nap. Pick up dinner. Take it back up to Kevin. Watch a movie with him. Then make sure he’s comfy and has everything he needs within reach for the long, and lonely, night ahead. That has been my routine since getting back into Springfield two weeks ago. In fact, it’s now been over four weeks since Kevin’s motorcycle accident. It’s been one helluva a ride and one I wouldn’t wish on my worst enemy. I would never wish for anyone to go through the sheer terror of wondering if a loved one, a person who I fiercely love, would live or die. Or not knowing if that loved one would ever walk again. Of living through three surgeries and then wonder if somehow the anesthesia didn’t somehow erase his memory and he doesn’t know who you are, or what he’s doing in the hospital, judging by the bewildered and scared look he gives you after coming out of his drugged state. Or following that loved one in an ambulance back to Springfield knowing that every bump of the truck was probably causing him excruciating pain. Of seeing numerous nurses and doctors (so many, in fact, that they all start to look alike after a while) come and go in and out of his room so many times that it’s almost a shock when we’re left alone. I never, in my wildest dreams, ever imagined anything like this would ever happen to us. When I got the phone call, the one every wife dreads, my brain prevented me from processing the full impact of what I was hearing. Even though I heard the sirens in the background, heard the urgency in the guy’s voice, even calling the guy back and finding out that Kevin had been hit head on, then flew through the air to land on his lower back across a concrete guard rail, did not really shake me out of my horror-induced, dream-liked state. When I saw Kevin, he looked fine. The witness and the doctors all told me, he was moving. He never lost consciousness. In fact, the first thing he did was raise his arms and wiggle his fingers, just to ensure he would be able to play guitar again. Even when they handed me his clothes, helmet, boots and gloves in a “Personal Belonging’s” white plastic bag and I pulled them out to see they had cut Kevin’s jeans and t-shirt in half, the face of his helmet scuffed and scarred where he landed on the gravel, a huge hole in the palm of his right glove, did it really dawn on me that this was serious. He looked fine. He was breathing. I thought we had dodged the bullet. God had protected him. He would be fine in a day or two. Doctors would talk about his miraculous recovery from such a serious accident. Our lives would not change. Things would be fine. It wasn’t until he had been wheeled into the Intensive Care Unit and the doctor called me and the boys to the side to show us his pelvis x-rays did it truly HIT ME that things would not be fine – at least, not for a very long time. Kevin was seriously injured. His pelvis had shattered – he compared it to a bag of glass. And it wasn’t until the doctor looked into my eyes and told us, me, the boys and Kevin, that no one in Springfield would touch him, that no one in Springfield had the skills necessary to put Kevin’s pelvis back together again did the seriousness of our situation truly, and honestly, hit me. Kevin may not walk again. Even though that sounds serious, it IS serious, I’ve never taken it seriously. I’ve never really entertained the thought that Kevin wouldn’t walk – I’ve always just thought it would happen at one point. I’ve never really toyed with the idea that he could remain in a wheelchair for the rest of his life. And throughout this whole ordeal, I’ve never really allowed myself to think “what if” because there was one part of my brain that simply refused to go down that dark road. Yes. I’ve had moments when I thought of everything that could have happened – he could have been paralyzed. He could have had brain damage. He could have had internal bleeding. He could have damaged an organ. And I would be lying if I didn’t tell you that there were moments that took me by surprise and I simply broke down and cried. Not the silent, tears running down my face sort of crying, but the ugly, I’m crying so hard I’m hiccuping sort of crying. The first time happened after his first surgery. The anesthesiologist had gone over all of the risks of putting him under and even though I’ve heard it all before through various avenues throughout the years, it was quite different when it applied to someone I loved with all my heart. It was scary. I was scared. So I was on edge before he even went in for his first surgery. I tried not to be nervous. I tried to be brave. I tried to distract myself. But inside, I was unraveling. A small, insignificant thread of control was beginning to loosen so by the time his first surgery was over and they told me that he was in recovery, I simply lost it. I cried so hard I couldn’t even catch my breath. I had sufficiently regained control of myself by the time Kevin was wheeled back to his room. I was relatively calm after his second surgery. I think I was stuck on auto-pilot at that point. I was focused entirely on Kevin – making sure he was as comfortable as humanly possible. Everything, and I mean everything, even the boys, faded into the background and all I could think about was being there for my husband. I lost it again after his third surgery. We had been told that the third surgery would be no big deal – a piece of cake compared to his other two surgeries. The bone that anchors the ball joint of his leg into his hip had shattered. They had to take the tiny shards of bone and screw them together again. They had to insert two small plates in order to reconstruct what should have been there. The surgery was considered a success and the doctors were pleased, but it was the last straw. As soon as the doctor left, I broke down and cried again. The last time was when the family all came up to Columbia to visit Kevin the weekend before he was released. Their love and support simply took my breath away and their overwhelming sympathy was my undoing. I lost it a third time. I had to step out of the hospital at one point because I started feeling claustrophobic. I don’t know what was going on that day, but the stench of sickness was simply overwhelming. I couldn’t breathe. My heart started beating fast and I had to step out of the hospital and sit on a bench, gasping for fresh air. It gave me a moment to clear my head. I regained control of my raging emotions and prayed for strength. These are really the only moments that I can recall really giving in to my emotions. The rest of the time, I’ve been on autopilot. Yes. Our situation has been stressful. Yes. There have been moments that I’ve been scared and unsure. But for the most part, I’ve simply functioned, concentrating instead on trying to take care of myself, getting enough to eat, trying to find a quiet place to sleep, so that I would have enough strength to take care of Kevin. 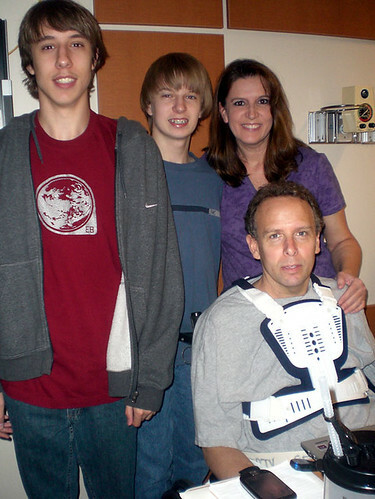 It’s been four weeks and two days since Kevin’s accident and I still find myself on autopilot. Though life is starting to slow as we near the time for Kevin to come home and I have the time to reflect on my life, both past and present, I’m still stuck in that mode. I think it might be safer that way. At least, for now.